Age-related macular degeneration (AMD) is a deterioration or breakdown of the eye’s macula. The macula is a small area in the retina–the light-sensitive tissue lining the back of the eye. The macula is the part of the retina that is responsible for your central vision, allowing you to see fine details clearly. With macular degeneration, you may have symptoms such as blurriness, dark areas, or distortion in your central vision, and perhaps permanent loss of your central vision. It usually does not affect your side, or peripheral vision. For example, with advanced macular degeneration, you could see the outline of a clock, yet may not be able to see the hands of the clock to tell what time it is. 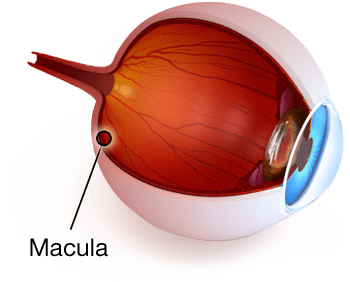 Causes of macular degeneration include the formation of deposits called drusen under the retina, and in some cases, the growth of abnormal blood vessels under the retina. With our without treatment, macular degeneration alone almost never causes total blindness. People with more advanced cases of macular degeneration continue to have useful vision using their side, or peripheral vision. In many cases, macular degeneration’s impact on your vision can be minimal. There are two types of macular degeneration: Dry or atrophic, macular degeneration (also called non-neovascular macular degeneration) with drusen. Most people who ahve macular degeneration have the dry form. This condition is caused by aging and thinning of the tissues of the macula. Macular degeneration usually begins when tiny yellow or white pieces of fatty protein called drusen form under the retina. Eventually, the macula may become thinner and stop working properly. Wet macular degeneration occurs when abnormal blood vessels being to grow underneath the retina. This blood vessel growth is called choroidal neovascularization (CNV) because these vessels grow from the layer under the retina called the choroid. These new blood vessels may leak fluid or blood, blurring or distorting central vision. Vision loss from this form of macular degeneration may be faster and more noticeable than that from dry macular degeneration. If your vision has become blurry, cloudy, or dim, or things you see are not as bright or colorful as they used to be, a cataract may have developed in one or both of your eyes. Many people say that their vision with cataracts is similar to the effect of looking through a dirty car windshield. As a cataract slowly begins to develop, you may not notice any changes in your vision at first. But as the cataract progresses, you may begin to find that it interferes with your daily activities. Performing a complete eye exam, your ophthalmologist can tell you whether a cataract or another problem is the cause of your vision loss. While cataracts are one of the most common causes of vision loss, especially as we age, they are treatable with cataract surgery. Since most cataracts are part of the normal aging process, they cannot be reversed. There are no medications or eye drops that will make cataracts go away–surgery is the only treatment. You and your ophthalmologist can discuss the cataract surgery procedure, preparation for and recovery after surgery, benefits and possible complications of cataract surgery, cataract surgery costs, and other important information. Together, you can decide if cataract surgery is appropriate for you. The retina is the light-sensitive tissue lining the back of our eyes. Light rays are focused on the retina through the cornea, pupil, and lens. The retina converts the light rays into impulses that travel through the optic nerve to our brain, where they are interpreted as the images we see. A healthy, intact retina is key to clear vision. The middle of the eye is filled with a clear gel called vitreous that is attached to the retina. Sometimes tiny clumps of gel or cells inside the vitreous will cast shadows on the retina, and you may sometimes see small dots, specks, strings, or clouds moving in your field of vision. These are called floaters. You can often see them when looking at a plain, light background, like a blank wall or blue sky. As we get older, the vitreous may shrink and pull on the retina. When this happens, you may notice what look like flashing lights, lightning streaks, or the sensation of “seeing stars.” These are called flashes. Usually, the vitreous moves away from the retina without causing problems. But sometimes the vitreous pulls hard enough to tear the retina in one or more places. Fluid may pass through a retinal tear, lifting the retina off the back of the eye–much as wallpaper can peel off a wall. When the retina is pulled away from the back of the eye like this, it is called a retinal detachment. The retina is a thin layer of light-sensitive tissue that lines the back of the eye. Light rays are focused onto the retina, where they are transmitted to the brain and interpreted as the images you see. The macula is a very small area at the center of the retina. It is the macula that is responsible for your pinpoint vision, allowing you to read, sew, or recognize a face. The surrounding part of the retina, called the peripheral retina, is responsible for your side of peripheral vision. Vitreous hemorrhage: Delicate new blood vessels bleed into the vitreous–the gel in the center of the eye–preventing light rays from reaching the retina. If the vitreous hemorrhage is small, you may see a few new, dark floaters. A very large hemorrhage might block out all vision, allowing you to perceive only light and dark. Vitreous hemorrhage alone does not cause permanent vision loss. When the blood clears, your vision may return to its former level unless the macula has been damaged. It may not sound logical that dry eye would cause excess tearing, but think of it as the eye’s response to discomfort. If the tears responsible for maintaining lubrication do not keep the eye wet enough, the eye becomes irritated. Eye irritation prompts the gland that makes tears (called the lacrimal gland) to release a large volume of tears, overwhelming the tear drainage system. The excess tears then overflow from your eye. When the vitreous gel pulls on the retina, you may see what look like flashing lights or lightning streaks. These are called flashes. You may have experienced this same sensation if you have ever been hit in the eye and seen “stars.” The flashes of light can appear off and on for several weeks or months. Glaucoma is a disease that damages the eye’s optic nerve. The optic nerve is connected to the retina–a layer of light-sensitive tissue lining the back of the eye–and is made up of many nerve fibers, like an electric cable is made up of many wires. It is the optic nerve that sends signals from your retina to your brain, where these signals are interpreted as the images you see. In the healthy eye, a clear fluid called aqueous humor circulates inside the front portion of your eye. To maintain a constant healthy eye pressure, your eye continually produces a small amount of aqueous humor while an equal amount of this fluid flows out of your eye. If you have glaucoma, the aqueous humor does not flow out of the the eye properly. Fluid pressure in the eye builds up and, over time, causes damage to the optic nerve fibers. Glaucoma can cause blindness if it is left untreated. Only about half of the estimated three million Americans who have glaucoma are even aware that they have the condition. When glaucoma develops, usually you don’t have any early symptoms and the disease progresses slowly. In this way, glaucoma can steal your sight very gradually. Fortunately, early detection and treatment (with glaucoma eyedrops, glaucoma surgery, or both) can help preserve your vision. The most common form of glaucoma is called primary open-angle glaucoma. It occurs when the trabecular meshwork of the eye gradually becomes less efficient at draining fluid. As this happens, your eye pressure, called intraocular pressure (IOP), rises. Raised eye pressure leads to damage of the optic nerve. Damage to the optic nerve can occur at different eye pressures among different patients. Your ophthalmologist establishes a target eye pressure for you that he or she predicts will protect your optic nerve from further damage. Different patients have different target pressures. Half of patients with glaucoma do not have high eye pressure when first examined. Some such individuals will only occasionally have high eye pressures on repeat testing; thus, a single eye pressure test misses many with glaucoma. In addition to routine eye pressure testing, it is essential that the optic nerve be examined by an opthalmologist for proper diagnosis. A less common form of glaucoma is closed angle (or narrow-angle glaucoma or angle-closure glaucoma). Closed-angle glaucoma occurs when the drainage angle of the eye becomes blocked. Unlike open-angle glaucoma, eye pressure usually goes up very fast. The pressure rises because the iris–the colored part of the eye–partially or completely blocks off the drainage angle. People of Asian descent and those with hyperopia (farsightedness) tend to be more at risk for developing this form of glaucoma. To learn more about these eye conditions, follow the links to the eyeSmart website. It is full of information and pictures that will help you learn about any given condition.